The EXO-C110 is Scorpion’s next generation take on a classic helmet. The EXO110 features subtle modern lines, an advanced ventilation system, a dual EPS liner, and an improved SpeedView sunvisor mechanism. The Scorpion EXO-C110 runs small, if you are in between sizes order the larger size. I have a Bell Pit Boss, but it gets a bit hot in summer so I bought the EXO-C110. I took a large in the Bell, and the Scorpion is the same, though I tried one on before I bought one. The vents work to keep it cooler than the Bell. One complaint I have is the speaker pockets - they seem a bit of a kluge, though they do work better than any I've tried on the Bell Pit Boss. My noggin is pretty narrow, and the Scorpion fits it perfectly, and while the snap to stow the end of the neck strap is fine, the D-Rings don't work as smoothly as the Bell's. I've used Scorpion EXO-100 for years and when it came time for a new helmet considered Bell Pitboss and LS2 as well, but ultimately decided to purchase a new model from Scorpion, EXO-C110. Why change something that I was so happy with already. Glad I went with EXO-C110, high quality helmet all around, perfect fit if you follow the sizing chart. What I'm very impressed with is the new ventilation (Florida rider), shield size & quality (I wear glasses and they fit perfectly even with the shield down) as well as the removable and washable liner that Pitboss doesn't have. Well done Scorpion!!! Revzilla customer service and delivery time is top notch...will buy from them again and highly recommend these guys to all!!! This is my second Scorpion helmet. What's great about for me is the fit. No modifications required to make it feel comfortable. I also love the flip down visor. No need to pull it down. It drops down with the push of a tab. It is what I was wanting. A helmet with pull down visor, air flow, although I wish it had even more. I like air flow. 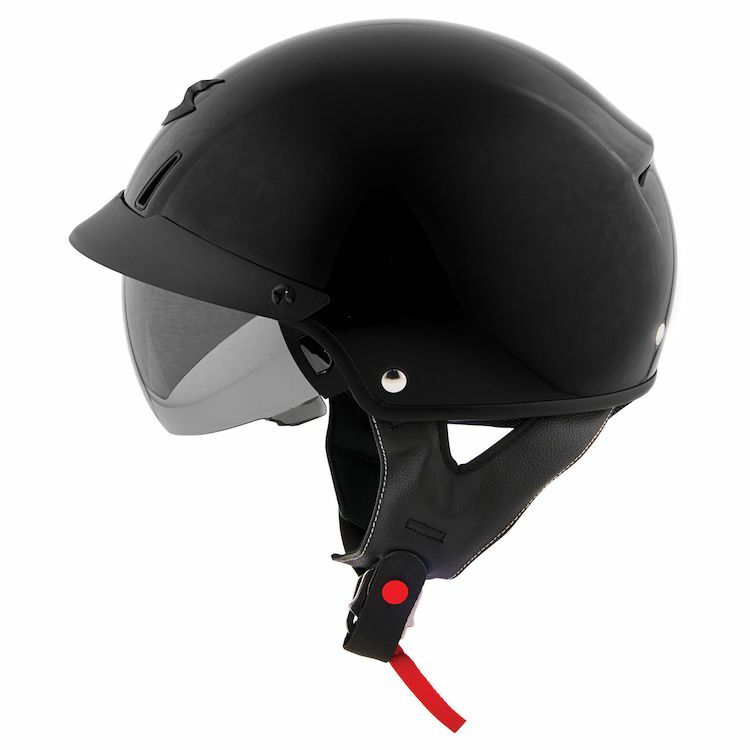 I was also wanting a good and comfortable set up for communications and this helmet has that with the speaker pockets. Helmet is also comfortable with glasses and thats a plus. A great improvement over previous scorpion helmets and I also liked them. Yes I recommend this helmet. This helmet was a great value, bang for the buck. The pull down shield fits over large glasses, it has removable ear pads, good ventilation, is lightweight and looks great. I highly recommend it. Great helmet for the price but then again all Scorpion helmets are top notch.Really like the removable ear covers/speaker holders on those cool mornings.Get a little buffeting with my windshield but I think it may be the visor.It does have the mushroom head feel but overall the helmet is great.Really like the tinted drop down visor too.I would rate it a solid 8 out of 10.Would be nice if it had snaps under the visor for face shield though. I like the helmet. Just a touch on the small side for an extra large. Nice features. My only complaint with the helmet is that they ran about 1 size to small. I ordered 2 helmets, 1 for my wife and we both had Scorpion helmets before these, she was a medium and I was an Xl. Revzilla Motorsports sent me the same size as before, with the agreement that if they didn't fit I could return them at no cost to me. I did have to return them both and had to go up 1 size on each to get them to fit. Good helmet, we both like them and Revzzilla was great to deal with. I have several helmets and already own an older EXO-C110 which is not vented. I wanted a vented half helmet for those really hot summer days. This one does the trick nicely! I wanted a half helmet that allowed me to insert speakers and that had air ventilation built in and had a retractable visor and the option to insert a clear visor. I only wish it came with a ratchet quick connector instead of the ridiculously archaic double d rings. Needed helmet with air vents! It's hot this year, head is sweating too much. Good reviews for a hot weather helmet. Live in Atlanta Georgia area. I have been wearing a novelty helmet as of late and I wanted to get some real proctection but most DOT beanie helmets give the mushroom look so I am trying this one. Wanted a good quality, low-price helmet with a sun visor. I ended up returning it because it was way bigger than I expected in person and made me look like a huge mushroom. have a beastly v-max 1700 . need a cruiser helmet to be right with my community of riders. I am also going to buy the scorpion modular from you for bug season and cold weather. ps.just got my v-max cover from you guys its great.keep it up . product videos are very helpful for on-line purchases. Live in south Florida, in summer time you have to have a cool helmet (weather related). I had a Bell Pit Boss, and thought I would try something else. I think there are some different benifits in the two. Because IVE HAD ONE BEFRE AND ITS A GREAT HELMET FOR ME! Looks good and is comfortable with good protection. Good reviews. Tried on. Felt great. For comfort, style and safety. size and color in light helmet hope it fits. Purchased this helmet for my own use last summer. My wife needed a new helmet and liked mine. I was also very satisfied with it. I trust Scorpion and wanted a half helmet. Fit well when I tried it on at the Motorcycle shop. I have one Scorpion helmet and like it very much, however, I wanted a white helmet to wear in the summer. One with vents and with pockets for ear pieces for our CB. This helmet has both. Good reviews,good price! Very happy with my choice! Bought matching set for my wife and myself. we have had the same helmet in the past, sold the bike and the helmets. bought another bike and want the same helmets. It had every feature I was looking for, especially the helmet ventilation, drop down eye shield and ability to change shield tints. I wanted a half helmet with vents and a flip-down visor for my scooter. This one is supposedly a moderate oval like the other brands that fit me well (neither of them---HJC or Nolan---offer what I'm looking for), and according to the reviews, the visor doesn't interfere with eyeglasses. Reviews were very favorable, too. This will be my first Scorpion helmet----hope it fits! already have a scorpion helmet, so I'm familiar with the fit, like the style and features. Especially like the attachable pads and vents, which are almost unheard of, in a half helmet. Will post a review once I get it and have a chance to ride wearing it. Great helmet for summer. Built in retractable sun shade and terrific ventilation. Quite comfortable as well. Normally wear a modular, wanted something lighter for the hot summer months coming and picked the Scorpion because I have a Scorpion modular and love it. I previously purchased a Scorpion EXO-C110 in wine color. I have changed motorcycles and wanted a new matching helmet. My main reasons for purchasing the Scorpion EXO-C110 is the ventilation and sun visor. I've had 2 Scorpion helmets and have been very pleased with them. This is a replacement. Half helmet, shiny black, vents, tinted sun visor, all in one package. has all the features I'm looking for. BEST ANSWER: I bought the black which is glossy.Waxed it and it looks grreat.The matte black is the flat/dull black. Is there a clear face / shield available for this helmet? if so how much? I am buying it for the rain - and I don't want a smoked screen. BEST ANSWER: Yes. I currently have a clear, smoked and amber shield. I love the helmet. also how does it fit over prescription glasses? With the shield down? is there ample room for Prescription Glasses with the Shield down? BEST ANSWER: There is plenty of room with the shield up or down. I tent to put them on after the helmet is on. There are notchs where your eyeglass arms fit. Plenty of room. I ride with riding glasses and use the shield when sun and/or wind conditions call for it. It fits great. There is plenty of room between my glasses and the drop-down sun visor. Is a neck curtain, chin curtain and ear curtains available for this helmet? BEST ANSWER: I purchased this EXO-C110 helmet to replace my HJC FG2, which I had had for many years. I purchased the Scorpio as it was the closest to the FG2 that I could find. The ventilation and sunshade on the Scorpio seem to work well. There is no neck or chin curtain, and small ear covers that seem to be designed for another helmet. In cold weather I wear an HJC SyMax, which I recently upgraded to the SyMax III. These are very warm helmets for winter riding, but have a lot of wind noise. The HJC fits me better then the Schubarth or the Tech. Don't recall the name. Hope this helps. I dont think so.Check Scorpions website. What type of visor does this ship with? It comes with a tinted dropdown eye shield. Dark smoke sun visor that works very well. what is the inside shape of this helmet? i wear a long oval in a western hat and find it very difficult to find a motorcycle helmet that fits my head shape. Most helmets that fit snug cause me a head ache and if they are comfortable they are to loose. Any info out there? BEST ANSWER: I have long oval head too. Didn't like the fit of this helmet so I returned it and got the Bell Pit Boss. It has an adjustment in the back to help it fit my head shape. Very happy with the Bell Pit Boss. For a full face helmet I use the Arai Siqnet Q. It has a perfect shape for a long oval head pricey but worth the money in my opinion. Same problem here. Try a Bell. BEST ANSWER: I think it feels very light. I also have an EXO 900 full head helmet and the C110 feels like a feather when I wear it. The helmet is light weight and very comfortable. I'm not sure of the exact weight of it. Is this helmet vented ? BEST ANSWER: Yes. it is vented with two intakes in the front and two exhausts in the rear. However there are no switches to close them off. I use this helmet in the colder months and the open vents have never been an issue. Yes, it is vented. I'm very happy with this helmet and would recommend it. Does the lightning bolt come off? BEST ANSWER: You could probably pry it off the you have a marred helmet. I have a black one for summer and a red one wear at Christmas while riding in my Santa suit. I don't find the lightning bolt objectionable. Great helmets!! I've always worn Harley Davidson helmets made by HJC, which I find extremely comfortable and a great fit in a Large...I like the extra features of the SCORPION EXO-C110 helmet when compared with the HJC IS-CRUISER helmet...would the Scorpion have a similar fit to the HJC? BEST ANSWER: I had an HJC FG2 which was great. They stopped making them, so I bought a Scorpion. It fits well, I like the flow through ventilation, which could be improved, and the drop down sun visor is a big help. I do not use the ear pieces, as I have an HJC SiMax !! for winter, with the pin lock shield.